This equation uses the latest published Australian Bureau of Statistics data, and dramatically shows us that we are rapidly approaching a critical shortage of rental accommodation in the major eastern cities. Record population growth is combining with the effects of savage cuts to investor and new housing finance to reduce the available stock of rental properties. The maths is alerting our State and Federal governments that it’s high time to stop punishing and start encouraging property investors, because it is investors who provide virtually all rental accommodation. If our governments fail to respond, they can expect a rapid escalation in asking rents in Sydney, Melbourne and Brisbane. 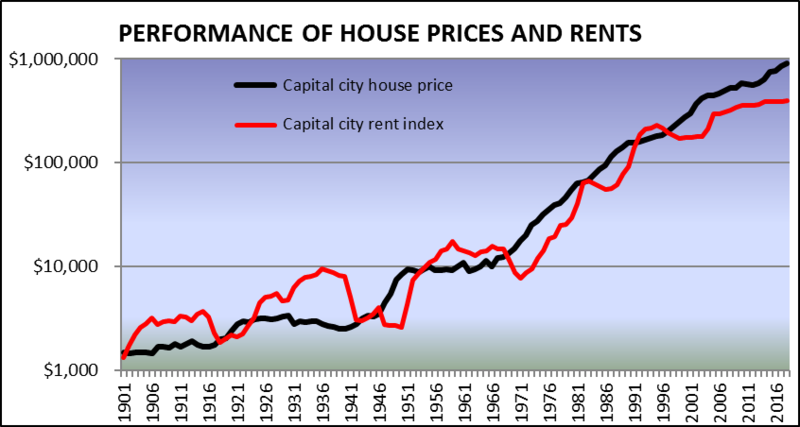 This graph shows just how much rents have fallen behind price growth in our capital cities, with the gap between growth (the black line) and rent return (the red line) steadily growing since 1999. Right now, the shortfall is the worst it has ever been. This situation occurs because rent growth tends to lag behind price growth in our big city markets, and indeed, rental yields in Sydney, Melbourne and Brisbane are now lower than at any time since the post-war housing boom. They do catch up, however, whenever prices stop rising. When capital city housing price growth slowed down or stopped in the past (for example from 1910 to 1916, 1929 to 1941 and from 1951 to 1965), you can see from the graph what happened next. Rents rose quickly and dramatically, as indicated by the red line. This has occurred because our capital city populations have always been growing, and if new residents can’t buy, they have to rent. The equation and the graph would indicate that rent rises are highly likely to occur again in the eastern capital cities. It also shows that this is likely to happen very soon and that cash flow will replace capital growth to become king.